The nuclear test by North Korea (DPRK) on 25 May unleashed a predictable torrent of pronouncements, mostly hypocritical and few suggesting anything approaching a meaningful analysis of the geopolitical struggle of which it was one event among many. There are many important, yet unanswered, questions of which the principle one is perhaps why, and how, did the Obama administration seemingly drift into confrontation with North Korea, with unpredictable but ominous consequences? How did Obama, who was elected on a platform of change and hope so quickly get enmeshed in the worst legacy of his predecessor? That, of course, stretches beyond the Korean peninsula to the Middle East; it is unfortunately not inconceivable that he will be remembered in history as having turned Bush’s two wars into four, by adding Pakistan and Korea. Obama had inherited a negotiation process which, although it had been stalled and derailed by hardliners in Washington, could with relative ease, had there been firm and unified leadership, been brought to a swift conclusion – “It could be worked out, in my opinion, in half a day” said Jimmy Carter. The situation on the Korea peninsula is quite unlike the intractable problems the US faces, for instance, in the Middle East. In Kim Jong Il, Obama has a counterpart who is strategic and in control of policy. In other words, a man who can deliver a deal if the price is right. And the price? Peaceful coexistence between the two sovereign states, the lifting of American sanctions against the DPRK, aid (or compensation for the 60 years of embargo). The DPRK wants an environment in which foreign trade and investment can be developed, since this is essential for its economic growth. The deal? The DPRK will denuclearise on a step-by step basis as the US fulfils its obligations. This is not an interpretation that will be familiar in the mainstream media, and it is contested by many, but there is plenty of evidence for it, though there is no space to elaborate here. Two voices from South Korea must suffice. 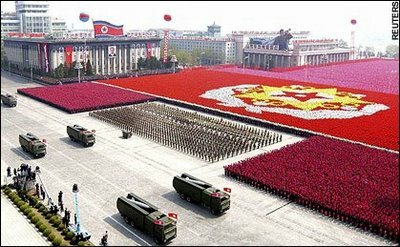 North Korea’s real aim is not to become a fully-fledged nuclear-armed state. Its real aim is to gain more economic support for itself and to establish diplomatic relations with the U.S. quickly in order to achieve its greater goal of becoming a “strong and prosperous country” by 2012…. Of course, North Korea can outwardly profess aspirations of becoming a nuclear state. This is a high-level negotiation tactic. Why the sanctions, and in particular the threat to interdict DPRK ships, will be ineffective. All the nuclear weapons states (NWS) were quick to denounce the test though all of them, except Israel, had conducted tests themselves (Table 1). Israel is an anomaly amongst NWS in that it has refrained from testing in order to preserve its strategic ambiguity; it neither confirms nor denies its nuclear status, although no one has any doubts about that. If it made its possession of nuclear weapons public, by a test or a declaration, then this would justify or pressurise, depending on your point of view, neighbouring states, including Iran, to go nuclear. So it has the deterrent power of nuclear weapons without the ‘provocation’ of making them public. Israel can do this because its nuclear arsenal has been developed with a little help from its friends, reputedly France, perhaps the US, who have done extensive testing. In normal circumstances no country would attempt to develop nuclear weapons without testing them, though in recent years computer simulations have complemented physical testing. Source: Query Nuclear Explosions Database Australian Government: Geoscience Australia, 2009 [Accessed 12 June 2009]. Available from http://www.ga.gov.au/oracle/nuclear-explosion.jsp. Note: The database only goes up to 2007, but the DPRK is the only country to have tested since India and Pakistan in 1998. Other sources give different figures especially for the smaller players; see for instance List of nuclear tests Wikipedia, 2009 [Accessed 12 June 2009]. Available from http://en.wikipedia.org/wiki/List_of_nuclear_tests. Pakistan’s reaction to the test seems to have been rather muted, perhaps because of American discrimination in favour of India – there was no ‘nuclear deal’ for Islamabad. Whatever their differences, all four [Nuclear weapons states] are sober and serious states, with long experience as major powers in the modern world. Communist China has no such experience. Its nuclear pretensions are both expensive and cruel to its people. It fools no one when it offers to trade away its small accumulation of nuclear power against the mighty arsenals of those who limit Communist ambitions. It shocks us by its readiness to pollute the atmosphere with fallout. that Red China’s demonstration of nuclear capability strengthens adherents of Mao’s strategy of conquering industrialized nations by taking over the underprivileged countries of the world. China may have become a ‘serious and sober state’ ’resolutely opposed’ to North Korea joining the nuclear club, but it is opposing US attempts to have the UNSC endorse mandatory sanctions, for reasons discussed below. Significantly, and in marked contrast to its present reaction to the DPRK nuclear tests, the United States, at that time, did not seem publicly to have entertained the idea of seeking a UNSC condemnation. It may have been that the UNSC had not yet got into the habit of censuring members for acts which were not illegal. Perhaps the Soviet veto (the China seat was at that stage still held by the rump Kuomintang government on Taiwan) was keeping the UNSC honest, or at least not allowing it to stray beyond the Charter. We have evidence that within recent weeks an atomic explosion occurred within the U.S.S.R. …. This probability has always been taken into account by us….… no single nation could, in fact, have a monopoly of nuclear weapons. This recent development emphasizes once again, if indeed such emphasis were needed, the necessity for that truly effective control of atomic energy which this government and the large majority of the members of the United Nations support. So no mention of an illegal act requiring United Nations condemnation. Rather an emphasis on ‘we knew it was coming, trust us, everything is under control, we’re still on top. That coupled with pious genuflections towards international copperation over nuclear issues. Genuflections still being repeated, with as little result, 60 years later. Perhaps now, as then , sincerity is lacking. The threat of nuclear weapons or material in the hands of terrorists remains the greatest threat facing our country today. This danger may increase as we stand on the forefront of a new boom in the construction of commercial nuclear energy plants. The G-8 summit in Kananaskis in 2002 established a G-8 Global Partnership Against the Spread of Weapons and Materials of Mass Destruction, and the 2006 G-8 summit in St. Petersburg launched a Global Initiative to Combat Nuclear Terrorism. Building on these efforts, the next administration should seek support for an annual high-level meeting on nonproliferation to develop new modes of stemming the transfer of nuclear weapons and materials that could end up in the hands of rogue states or terrorists. On July 9, 2006, India conducted its first test of an intermediate-range ballistic missile, bringing it one step closer to joining the small group of states to possess such capabilities. Although the test was unsuccessful, the development of the missile, designated the Agni III (“fire” in Hindi), has considerable implications for the region. With an expected range of between 3,000 and 4,000 km, this nuclear-capable missile would put major cities in eastern China, including Beijing and Shanghai, within India’s reach for the first time. In spite of such implications and the fact that the test came only five days after North Korea’s widely condemned firing of seven missiles, including the unsuccessful test of the 5,000-6,000 km range Taepodong II, the Agni III launch received little international attention and subdued official reaction from the few states that did comment on the development. The response highlighted the readiness of foreign governments to distinguish between military advances made by a state perceived to be a responsible member of the international community and those pursued by a nation perceived as a repeated violator of international norms. Within India, however, the failure of the Agni III test triggered extensive criticism among domestic observers. ….. Although the Agni III launch, like that of the Taepodong II, was conducted by a state possessing nuclear weapons and involved a missile that could eventually pose a new threat to a potential adversary, the Indian launch inspired little comment. This comes from WMD Insights, an online journal on weapons of mass destruction (WMD) ‘sponsored by’ the Defense Threat Reduction Agency of the US Department of Defense. The WMD covered by the journal are foreign ones of course, and mainly nasty foreigners at that; the US and its allies do not seem to be of much interest. India at that time was only half an ally. We are told that that the varying reactions to the tests of the two countries shows that governments ‘distinguish between military advances made by a state perceived to be a responsible member of the international community and those pursued by a nation perceived as a repeated violator of international norms’. Perhaps a more persuasive explanation is that the Indian missiles were targeted at China and the Korea ones at the US. Missile tests are neither illegal, nor unusual. Satellites take this further. Whilst launching a satellite is clearly a demonstration of intercontinental ballistic missiles (ICBM) capability – hence the shock of the Soviet Sputnik in 1957 – satellite launches are not the same thing as missile tests. They are ploughshares which can be turned into swords, or as the DPRK Foreign Ministry put it, they are like ‘kitchen knives and bayonets’. Source: Satellite Wikipedia, 8 June 2009 [Accessed 12 June 2009]. Available from http://en.wikipedia.org/wiki/Satellite. The UNSC condemnation of the attempted satellite launch by the DPRK on 5 April 2009 was a further blatant violation of both the Charter and natural justice and the nuclear test was, in part, a reaction to it. Following the censure of the test, and the pending resolution proposing sanctions, there are frequent reports that North Korea is preparing for a further launch. Whether this an ICBM, as prefigured in the statement of 29 April, or another satellite attempt, is unclear. It is likely that it is the latter, for two reasons. Firstly it will be more difficult for the US, and allies such as Japan, to condemn it on the grounds that it is a missile rather than a satellite if it is successful. Japan has a certain moral high ground when it comes to condemning nuclear weapons and tests because it does not yet have nuclear weapons, though it could soon do so and its virulently anti-DPRK policy is to a large degree driven by the desire to remilitarise and perhaps weaponise. It is ironical that the April launch, which the US and South Korea governments seem to have obliquely accepted as a satellite, could be misrepresented precisely because it was unsuccessful. Secondly, there is a little-noticed competition between the two Koreas to be the first to launch a satellite. South Korea has some ten satellites currently in orbit but has not yet launched its own, but is due to change with the Korea Space Launch Vehicle-1 (KSLV-1) planned to be launched 30 July, some seven months behind schedule. If there are two Korean satellites in orbit at the same time will it be possible to condemn one and praise the other? Probably, but it will take a bit more distortion of reality than usual. The pending UNSC sanctions are largely modelled on the US-led Proliferation Security Initiative [PSI]. This claims to be there to cut off North Korea’s arms exports, and particularly ‘weapons of mass destruction’. We are constantly told how North Korea, in John Bolton’s phrase, is an ‘aggressive proliferator.’ This is all rather curious because when we look at what figures are available North Korea as an arms exporter seems to fall off the radar. The US State Department, during the Clinton administration, published a series of reports on World Military Expenditures and Arms Transfers. The last full version covered the period 1989-2000. That is the source for the table below. The reports were discontinued, but a 2005 edition is now in the process of being published online. It is unclear when it was decided to resuscitate the report – it may have happened in the latter part of the Bush administration, or may have been an Obama initiative – but its temporary demise clearly points to an unease at State (perhaps Bolton himself?) that their own figures were at such a variance with the message. Source: “World Military Expenditures and Arms Transfers, 1999-2000.” Washington: State Department, 2003. The 2005 edition has not got to the stage of publishing data on arms transfer. Furthermore, using data from the Stockholm International Peace Research Institute on arms exports we see that North Korea’s exports have dwindled to below the US$0.5 million threshold (Table 1). Not so the United States, which is by far the world’s largest arms exporter. Moreover South Korea has overtaken the North as an arms exporter and in the decade 1999-2008 exported nearly twice as much as the North. Both of them are minnows compared with the American whale; over that decade the South’s arms exports were 1.0% of the US, and the North’s just 0.6%. It may be that the SIPRI figures underestimate the true amounts, and it may be true that arms exports, whatever level they may be, make an important contribution to the North Korea economy, though that seems increasingly unlikely. It is clear, however, that North Korea is a very small player in the world’s arms trade. The British academic Hazel Smith has recently combed through the records of the international insurance companies, where all ships are registered and concluded there is not much in the way of evidence of any trade by DPRK vessels in WMD. South Korea has imposed financial sanctions on three North Korean companies for a long-range rocket launch that Pyongyang conducted in April in defiance of repeated warnings by the international community, Seoul officials said Tuesday… No South Korean companies currently maintain business relations with any of the three North Korean firms. None of the North Korean firms hold any assets in the South, either, the ministry said. The second reason is rather more ominous. The PSI, it will be recalled, was initiated by John Bolton, who was at the time Undersecretary of State for Arms Control so presumably knew the situation. It is likely that that it is really intended to throttle North Korea’s exports in general, and, if things go really well, to spark a crisis that might lead to military conflict. Before leaving the issue of arms transfers let us briefly consider the other side of the equation, and look at the statistics on imports in the two Koreas (Table 5). This is relevant because we are constantly told that the North is a threat to the South, and that is why the American presence is so necessary. This is also the underlying justification for the UNSC resolutions, that the actions of the DPRK represent ‘a threat to international peace and security’. There are many ways to demolish that argument, beyond the scope of this essay, but the hugely disparate amount of arms imports between the two halves does strongly suggest that whatever threat there is comes from the South. Over the past decade South Korea imported $11.2 billion, and North Korea a mere $278 million, or 2.5% of the Southern figure. It would also seem, from press reports, that the South is importing much more advanced technologies. The United States is a superpower in decline and its loss of overwhelming military superiority is one aspect of this. In 1945 it had a monopoly on nuclear weapons, leadership in military capability, and underlying these, both the world’s largest economy, strengthened rather than enfeebled by the war, and a resilient and confident policy. The years since then have inevitably seen an erosion of that position of dominance. The struggle of the DPRK to force the United States into peaceful coexistence has nearly as long a history. That struggle is not yet won, and may well fail. Failure would probably not be marked by any loss of will for independence, though after the death of Kim Jong Il that is a possibility, but would be more likely to be accompanied by some sort of military conflagration with incalculable consequences. However, things are unlikely to come to that pass by any measured action by the involved governments. For instance, in 2008, Paul B. Stares and Joel S Wit, in a report for the Council on Foreign Relations pointed out that an invasion of North Korea – ‘stabilization force’ was the euphemism employed – would probably require 460,000 troops. It is difficult to contemplate President Obama willingly going for that, even if most of the troops were South Korean. The real danger comes from unplanned, spontaneous actions by low-level commanders sparking a crisis which spins out of control. That is where the danger of the pending UNSC resolution lies. During the Cold War the Security Council veto was used by the weaker members, the Soviet Union and then China when it regained its seat, to block resolutions by the stronger ones, mainly the US, and their proxies, that would transgress the acceptable boundaries of international realpolitik. Since the end of the Cold War it seems that the veto has been dropped in favour of a dual strategy, and this certainly seems to have been evident in the case of North Korea. Instead of formally vetoing the resolution China, and Russia, seek to tone it down. For instance China and Russia have opposed the mandatory obligation to search DPRK vessels on the high seas, pointing out that it violated international law. If the flag State (i.e. the DPRK) refuses to allow inspection on the high seas the UNSC ‘decides that the flag State shall direct the vessel to proceed to an appropriate and convenient port for the required inspection by the local authorities’. But who decides what is an ‘an appropriate and convenient port’? The other part of the strategy has been not to enforce the UNSC sanctions. However, it is clear that the current resolution leaves plenty of scope for other powers, principally but not exclusively the United States, South Korea, and Japan, to take actions which might provoke a reaction from North Korea. Again, it is unlikely that this would happen by a conscious strategic decision from the top, but it is a flammable situation. A single spark can start a prairie fire. Nevertheless, it is unlikely that anything apocalyptic will happen. There will be a lot of high-blown rhetoric and posturing – such is the stuff of geopolitics – but probably underlying constraint and caution. The real challenge will be for the Obama administration to extricate itself from the volatile situation into which it has stumbled, and to return to meaningful negotiations with North Korea. If it can do that, and makes the strategic decision to resolve the confrontation with the DPRK – and there are good imperial reasons why it may not want to – then next part will be relatively easy. It’s getting to that stage that will be difficult. Peter James Spielmann, “Carter: If no Palestine, Israel sees ‘catastrophe’ ” Associated Press, 26 January 2009. Mohamed ElBaradei, “A recipe for survival,” New York Times, 16 February 2009. Yoel Marcus, “Even a blizzard begins with tiny snowflakes,” Haaretz, 10 May 2009. Steven Aftergood and Hans M Kristensen, Israel: Nuclear weapons (Federation of American Scientists, 8 January 2007 [accessed 8 June 2009]); available from http://www.fas.org/nuke/guide/israel/nuke/. Warner D. Farr, “The third temple’s holy of holies: Israel’s nuclear weapons,” USAF Counterproliferation Center, Air War College, Air University, Maxwell Air Force Base, Alabama Counterproliferation Paper No. 2 (1999). Caroline Glick, “Column One: Israel and the Axis of Evil,” Jerusalem Post, 27 May 2009, Barak Ravid, “Israel demands world ‘respond decisively’ to North Korea nuclear test ” Haaretz, 25 May 2009. For an Iranian on the issue see “Israel, not DPRK the biggest danger,” PressTV, 26 May 2009. David Cortright, “India’s Nuclear Challenge,” Fourth Freedom Forum 2001. India: Nuclear Weapons (8 November 2002 [accessed 9 June 2009]); available from http://www.fas.org/nuke/guide/india/nuke/index.html. For example: Jimmy Carter, “India nuclear deal puts world at risk,” International Herald Tribune, 11 September 2008, Brad Glosserman and Bates Gill, “Widespread fallout from India-US pact,” Asia Times Online (2008), Daryl G. Kimball and Joe Cirincione, “A Nonproliferation Disaster ” Arms Control Association, 11 December 2006. “India takes tough stand on North Korean nuclear test,” Times of India, 26 May 2009. “Chinese gov’t “resolutely opposes” DPRK’s nuclear test ” Xinhua 2009. Lyndon B. Johnson, “Text of Johnson’s Address to the Nation,” New York Times 1964, 14. James Sullivan, “PREDICT BOMB WILL INCREASE RED TAKEOVER,” Chicago Tribune 1964, 11. Neil MacFarquhar, “Talks on North Korea Sanctions Stall Over Inspections ” New York Times 2009. Glyn Ford, “The new nuclear power,” New Statesman, 4 June 2009. “Explosion!,” New York Times 25 September 1949, E1. Hightower John, “Atom Blast News Stuns Washington,” The Hartford Courant 1949, 2. “WHAT THEY SAY: SOME COMMENT ON RED A-BOMB,” Chicago Daily Tribune (1872-1963) 1949, 2. Charles Hanley, “Obama’s word breaks ice in Geneva arms talks,” Associated Press, 16 May 2009, George P. Shultz et al., “Toward a Nuclear-Free World,” Wall Street Journal, 15 January 2009. For a couple of contrasting comments see Harold Brown and John Deutch, “The Nuclear Disarmament Fantasy,” Wall Street Journal, 19 November 2007, Ji-seok Kim, “A world without nuclear weapons,” Hankyoreh, 26 December 2008. David E. Sanger, “Four Scenarios, and Not One Ends Happily ” New York Times, 9 July 2006.; Charles D. Ferguson, Preventing Catastrophic Nuclear Terrorism (Washington DC: Council on Foreign Relations, 2006), Michael A. Levi, Deterring State Sponsorship of Nuclear Terrorism (Washington DC: Council on Foreign Relations Press, 2008). “DPRK Ready to Join 5 More Anti-Terror Pacts,” People’s Korea, 25 December 2001, “DPRK Signs Anti-Terror Conventions,” People’s Korea, 13 December 2001, “DPRK Stance towards Terrorist Attacks on U.S.,” KCNA, 12 September 2001, Young-jin Oh and Key-young Son, “N.K. Sent US Private Cable on Anti-Terrorism,” Korea Times, 23 September 2001, “U.S. in great panic,” KCNA, 12 September 2001. Tim Beal, “The United Nations and the North Korean missile and nuclear tests ” NZ Journal of Asian Studies 9, no. 2 (2007): 104-25. “INDIA’S AGNI III MISSILE TEST MAKES FEW WAVES ABROAD, MORE AT HOME,” WMD Insights (2006). Beal, “The United Nations and the North Korean missile and nuclear tests “. “Spokesman for DPRK Foreign Ministry Slams Anti-DPRK Campaign over Its Projected Satellite Launch,” KCNA, 24 March 2009. “UNSC Urged to Retract Anti-DPRK Steps,” KCNA, 29 April 2009. “S Korean govt admits dprk rocket followed satellite trajectory,” China Daily, 14 April 2009, “U.S. failed to use best radar for N. Korea missile,” Washington Times, 15 April 2009. “Korea Ready to Launch Own Satellite ” Chosun Ilbo, 16 April 2009, “S. Korea Completes Work on Naro Space Center,” Korea Times, 10 June 2009. Committee on Homeland Security and Governmental Affairs, US Senate (Washington: 2006), Larry M. Wortzel, “North Korea’s Connection to International Trade in Drugs, Counterfeiting, and Arms,” Senate Governmental Affairs Subcommittee on Financial Management, Budget, and International Security, 20 May 2003. The 1999-2000 edition was the 28th edition. The previous publisher was U.S. Arms Control and Disarmament Agency. “World Military Expenditures and Arms Transfers, 1999-2000,” (Washington: State Department, 2003). World Military Expenditures and Arms Transfers 2005 (State Department, 2009 [accessed 10 June 2009]); available from http://www.state.gov/t/vci/rls/rpt/wmeat/2005/index.htm. Paul Eckert, “N.Korea ships smuggle goods, but not WMDs: report,” Reuters, 5 March 2009, “North Korean Shipping: The Potential for WMD Proliferation?,” East West Center, 5 March 2009. “Seoul Slaps Sanctions on NK Firms Over Missile Test,” Korea Times, 9 June 2009. “Bolton: Trafficking in Weapons of Mass Destruction is a Global Problem,” America.gov [US State Department], 4 December 2003. Paul B. Stares and Joel S. Wit, Preparing for Sudden Change in North Korea (Washington DC: Brookings Institution Press for Council on Foreign Relations, 2009). MacFarquhar, “Talks on North Korea Sanctions Stall Over Inspections “. Aftergood, Steven , and Hans M Kristensen. Israel: Nuclear weapons Federation of American Scientists, 8 January 2007 [Accessed 8 June 2009]. Available from http://www.fas.org/nuke/guide/israel/nuke/. Beal, Tim. “The United Nations and the North Korean missile and nuclear tests ” NZ Journal of Asian Studies 9, no. 2 (2007): 104-25. Bolton, John R. “US nonproliferation policy after Iraq (Testimony to Committee on International Relations, US House of Representatives).” 4 June 2003. “Bolton: Trafficking in Weapons of Mass Destruction is a Global Problem.” America.gov [US State Department], 4 December 2003. Brown, Harold, and John Deutch. “The Nuclear Disarmament Fantasy.” Wall Street Journal, 19 November 2007. Carter, Jimmy. “India nuclear deal puts world at risk.” International Herald Tribune, 11 September 2008. Cortright, David “India’s Nuclear Challenge.” Fourth Freedom Forum 2001. “DPRK Ready to Join 5 More Anti-Terror Pacts.” People’s Korea, 25 December 2001. “DPRK Signs Anti-Terror Conventions.” People’s Korea, 13 December 2001. “DPRK Stance towards Terrorist Attacks on U.S.” KCNA, 12 September 2001. Eckert, Paul “N.Korea ships smuggle goods, but not WMDs: report.” Reuters, 5 March 2009. ElBaradei, Mohamed. “A recipe for survival.” New York Times, 16 February 2009. “Experts diagnose S. Korea’s options while agreeing going nuclear is not N. Korea’s real aim.” Hankyoreh, 27 May 2009. “Explosion!” New York Times 25 September 1949, E1. Farr, Warner D. “The third temple’s holy of holies: Israel’s nuclear weapons.” USAF Counterproliferation Center, Air War College, Air University, Maxwell Air Force Base, Alabama Counterproliferation Paper No. 2 (1999). Ferguson, Charles D. Preventing Catastrophic Nuclear Terrorism. Washington DC: Council on Foreign Relations, 2006. Ford, Glyn. “The new nuclear power.” New Statesman, 4 June 2009. Glick, Caroline. “Column One: Israel and the Axis of Evil.” Jerusalem Post, 27 May 2009. Glosserman, Brad , and Bates Gill. “Widespread fallout from India-US pact.” Asia Times Online (2008). Hanley, Charles. “Obama’s word breaks ice in Geneva arms talks.” Associated Press, 16 May 2009. Harden, Blaine “Value of N. Korea Sanctions Disputed.” Washington Post, 12 June 2009. Hwang, Balbina Y. “Curtailing North Korea’s Illicit Activities.” Heritage Foundation, 25 August 2003. “INDIA’S AGNI III MISSILE TEST MAKES FEW WAVES ABROAD, MORE AT HOME.” WMD Insights (2006). “India takes tough stand on North Korean nuclear test.” Times of India, 26 May 2009. India: Nuclear Weapons 8 November 2002 [Accessed 9 June 2009]. Available from http://www.fas.org/nuke/guide/india/nuke/index.html. “Israel, not DPRK the biggest danger.” PressTV, 26 May 2009. John, Hightower. “Atom Blast News Stuns Washington.” The Hartford Courant 1949, 2. Johnson, Lyndon B. “Text of Johnson’s Address to the Nation.” New York Times 1964, 14. Kim, Ji-seok. “A world without nuclear weapons.” Hankyoreh, 26 December 2008. Kim, Sam. “N. Korea conducts second nuclear test, draws condemnation ” Yonhap, 25 May 2009. Kimball, Daryl G. , and Joe Cirincione. “A Nonproliferation Disaster ” Arms Control Association, 11 December 2006. “Korea Ready to Launch Own Satellite ” Chosun Ilbo, 16 April 2009. Levi, Michael A. Deterring State Sponsorship of Nuclear Terrorism. Washington DC: Council on Foreign Relations Press, 2008. MacFarquhar, Neil. “Talks on North Korea Sanctions Stall Over Inspections ” New York Times 2009. Marcus, Yoel “Even a blizzard begins with tiny snowflakes.” Haaretz, 10 May 2009. Committee on Homeland Security and Governmental Affairs. Washington, 2006. ———. The (Non) Impact of UN Sanctions on North Korea. Washington DC: Peterson Institute for International Economics, 2008. “North Korean Shipping: The Potential for WMD Proliferation?” East West Center, 5 March 2009. Oh, Young-jin, and Key-young Son. “N.K. Sent US Private Cable on Anti-Terrorism.” Korea Times, 23 September 2001. Ravid, Barak. “Israel demands world ‘respond decisively’ to North Korea nuclear test ” Haaretz, 25 May 2009. “S Korean govt admits dprk rocket followed satellite trajectory.” China Daily, 14 April 2009. “S. Korea Completes Work on Naro Space Center.” Korea Times, 10 June 2009. Sanger, David E. “Four Scenarios, and Not One Ends Happily ” New York Times, 9 July 2006. “Seoul Slaps Sanctions on NK Firms Over Missile Test.” Korea Times, 9 June 2009. Shultz, George P. , William J. Perry, Henry A. Kissinger, and Sam Nunn. “Toward a Nuclear-Free World.” Wall Street Journal, 15 January 2009. Spielmann, Peter James. “Carter: If no Palestine, Israel sees ‘catastrophe’ ” Associated Press, 26 January 2009. “Spokesman for DPRK Foreign Ministry Slams Anti-DPRK Campaign over Its Projected Satellite Launch.” KCNA, 24 March 2009. Stares, Paul B. , and Joel S. Wit. Preparing for Sudden Change in North Korea. Washington DC: Brookings Institution Press for Council on Foreign Relations, 2009. Sullivan, James. “PREDICT BOMB WILL INCREASE RED TAKEOVER.” Chicago Tribune 1964, 11. “U.S. failed to use best radar for N. Korea missile.” Washington Times, 15 April 2009. “U.S. in great panic.” KCNA, 12 September 2001. “UNSC Urged to Retract Anti-DPRK Steps.” KCNA, 29 April 2009. “WHAT THEY SAY: SOME COMMENT ON RED A-BOMB.” Chicago Daily Tribune (1872-1963) 1949, 2. World Military Expenditures and Arms Transfers 2005 State Department, 2009 [Accessed 10 June 2009]. Available from http://www.state.gov/t/vci/rls/rpt/wmeat/2005/index.htm. “World Military Expenditures and Arms Transfers, 1999-2000.” Washington: State Department, 2003. Wortzel, Larry M. “North Korea’s Connection to International Trade in Drugs, Counterfeiting, and Arms.” Senate Governmental Affairs Subcommittee on Financial Management, Budget, and International Security, 20 May 2003.